When the Batcave (76052) set landed at my doorstep, I must admit I wondered what I was going to do with it. It doesn’t look like there is much there for someone who is mostly interested in modular buildings and conversions. Let’s see how it stacks up. Read the full modular conversion review here! The Beach Hut (31035) was the smallest of the three buildings (or four, if you count the Detective’s Office) released in the Creator range this year. At less than 300 parts, you’d be forgiven for assuming that it doesn’t go very far as a modular. Read the review to see how it stacks up. The thing that immediately caught my attention when the high resolution images of the KwiK-E-mart (71016) were first released was the amount of interior detailing and the printed parts. In this respect, it doesn’t disappoint in real life! But how does it stack up as modular or a parts pack? Read the full review here! When I see a new set, the first couple of things that I ask myself is how I could convert it to a modular building and whether it would make a good parts pack for an MOC modular building. To help answer these questions, I’m going to start a new type of review, which I’m calling the modular conversion review. First cab off the rank is the Heartlake Hair Salon (41093), which was released in January this year. 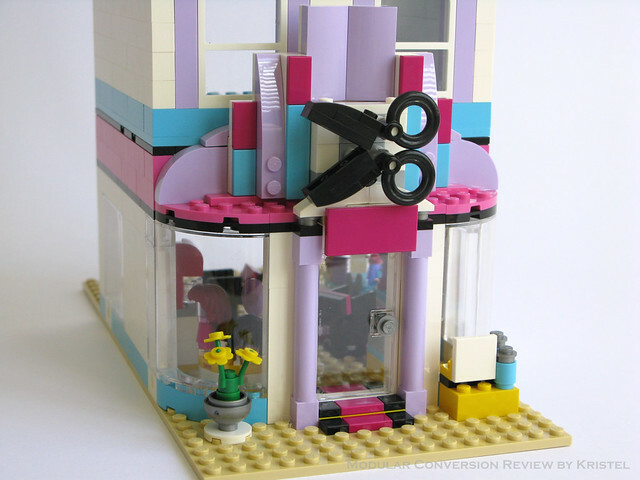 Read the full modular conversion review!